I am going to make a confession. I am not yet done with this book. I'm really close, but I just cannot say that I have finished it and have any sense of completion when I have not yet reached that point. You may think my review is worthless then, but I can truly say it may be more revealing than any other I have written and shared with my readers. 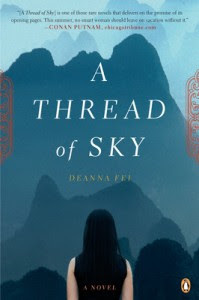 See, A Thread of Sky, by Deanna Fei is quite an intriguing read. The cast of characters is incredibly intense. We have Irene, the not quite matriarch of her family, who starts us off and appears to be the main character. Then we learn about her daughters. All three of them. And her sister. And then there's Ma. We don't meet Ma right away, but she, SHE is the matriarch. She is the grandma, the ma, the character we observe silently and almost gloss over for much of the story. But she is the person the girls seem to respect more than anyone. And yes, I do include Irene and her sister, two grown women, while using the term "girls" there. I am really enjoying this book and feel that I would do it a disservice to rush through the rest of it just to say I've finished, which is why I have not yet done so. I have enjoyed the details of their trip to China, and the memories of their past, their relationships, and so much more. Sometimes there is a little too much detail. I found that most in the chapters that cover Irene. I suppose she is supposed to be the most "boring" of the characters, in that we're trying to watch her recapture her family through this *vacation* she has pulled together. I'm just not sure about the flashes we get from her. They lead me to skim the pages a little bit. So while I confess that there are certain parts I could do without, there are others that I enjoy, but find a bit confusing, as well. The interweaving of the characters is what is slowing me down a little bit, as the sisters (the younger set - of three, Nora, Kay and Sophie) are almost so overlapping that I am mixing them up with one another. So while each has their own scenarios and their own life, I am finding myself flipping back a bit to be sure that this one is the one who was engaged, sort of, and this other sister is the one with the body image issues, and so forth. I suppose all of this represents great writing, and I think that is the case with this novel. So if you're interested in a read that is chock full of China's beauty, some history, detailed and told from the perspective of many different women from within one family, I recommend A Thread of Sky to you. While it hasn't been the quickest or easiest read for me thus far, it's definitely been one that has shown the most growth of character and family, and I look forward to turning the final pages to see where they all wind up. Just wanted to add that I finished the book last night! (4-25) I was too tired to come update, but I actually really enjoyed the ending. The last chapters were the most succinct, and yet the most detailed. I think this book could have been done a bit shorter, with the same outcome, but that it's still well worth the read. Slow books can be frustrating but also really good reads. I FINALLY finished The Alienist. It took me 3 weeks! Whew! Then I read Snow Flower and the Secret Fan in one night. It was a great change of pace for me. You know, sometimes I'd actually prefer to write a review while in the midst of a book - my feelings are more fresh while I'm still reading. Still, I'm glad to know you finally made it to the end and that you enjoyed that part as well!